Ball 16 oz. 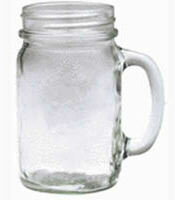 Drinking Jars has a smooth plain surface on all sides. These unique jars are perfect for serving lemonade or tea. Dishwasher safe. Not intended for hot drinks. Not for home canning use.